In the first part of Agents of S.H.I.E.L.D. season 3, Director Phil Coulson and his team have been spread thin on a variety of different missions, dealing with the rising number of Inhumans and the resurgence of Hydra thanks to former agent Ward. Additionally, the ATCU was formed to officially combat the Inhuman problem and act as a rival organization to S.H.I.E.L.D., which still operates unbeknownst to much of the world. Last week, all the story threads came together, giving many of the characters their own action-filled and emotional arcs, specifically Coulson. In this week's midseason finale episode, 'Maveth', written by Jeffrey Bell and directed by Vincent Misiano, Coulson -- who is no longer director of S.H.I.E.L.D. -- continues on his mission for vengeance against Ward, while the Hydra agent leads a team, including the kidnapped Fitz, on the mysterious distant planet they've dubbed Maveth. Back on Earth, Director Mack takes charge and leads the new S.H.I.E.L.D., along with a team of powered individuals into the fortified Hydra castle on a rescue mission. We've seen a lot of changes to S.H.I.E.L.D. in the last two episodes, the most prominent being Coulson stepping down as Director and handing the reins over to Mack. During his first day on the job, Mack gave the green light to the team of Inhumans Daisy has been lobbying for all season -- what we know to be the Secret Warriors, though no one on Agents of S.H.I.E.L.D. has called them that yet. Still, although the team may only include Daisy, Lincoln, and Joey, they have their brief moments in 'Maveth'. Juan Pablo Raba in particular shines as Joey, demonstrating the character's newness as a S.H.I.E.L.D. rookie, in addition to only recently discovering his "amazing new superpower." On the whole though, the Secret Warriors are more of a minor point in the overall midseason finale, leaving the viewer wanting more -- which Agents of S.H.I.E.L.D. will hopefully provide in the second half of season 3. On the other hand, Henry Simmons is allowed to shine in 'Maveth' with Mack stepping up to his new responsibility of leading S.H.I.E.L.D. For much of season 3, Mack has acted as the voice of reason and while S.H.I.E.L.D. seems to be facing an impossible task in this episode, it's Mack who grounds the team and keeps everyone organized and focused. 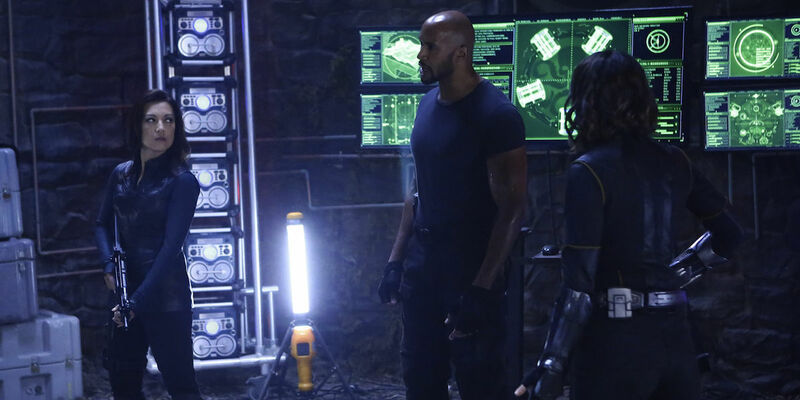 As a result, Simmons' performance has a similar effect on the episode as a whole, grounding the otherworldly and complicated drama of 'Maveth' in a fairly standard mission for the Agents of S.H.I.E.L.D. Last we saw Maveth, in the Simmons-focused '4,722 Hours', the planet became a character unto itself with the mysterious creature a part of its identity and history. Now, returning to the planet with Fitz, Ward, and Coulson in 'Maveth' allowed Agents of S.H.I.E.L.D. to provide more insight into the planet and the society that used to inhabit the world, but at the sake of Maveth’s character. This change could be chalked up to the fact that viewers are seeing the planet through the eyes of characters that don't care much to learn about it since they are focused elsewhere -- either on rescuing Will or Fitz, or bringing the creature back to Earth -- but it feels more like the episode is being rushed. Still, returning to Maveth manages to wrap up all those story threads revolving around the planet, namely the fate of Will and his effect on Fitz and Simmons' relationship. These threads are wrapped up easily in a fairly well-delivered twist when it is revealed that the person Fitz thought to be Will is actually the creature inhabiting Maveth -- who claims Will died saving Simmons. It doesn't hold quite enough emotional weight to be a satisfactory conclusion to this ongoing storyline, but it's serviceable to offering closure and setting up an arguably more compelling arc for Ward in the second half of season 3. The biggest emotional arc to conclude in 'Maveth' is the ongoing fight between Coulson and Ward. After Ward killed Rosalind Price in 'Closure', Coulson was determined to seek vengeance against his former agent and he achieved it by killing Ward -- crushing Ward's chest with his super-strong prosthetic hand. After the devolution of Coulson in 'Closure' that began with him stepping down as director, his final step in killing Ward was a dark moment that was earned by his character arc in not only the past two episodes especially, but the entire third season as well. Still, killing Ward wasn't a small decision and it will likely have a lasting effect on Coulson that may be explored in the second half of season 3. As for Ward, he also reached a turning point in 'Closure' when he chose to look forward by going on the mission to Maveth rather than stay behind and continue seeking vengeance. 'Maveth' sees Ward head down an entirely new path, which he foreshadows when describing the planet: "It isn't death, it's a new beginning." Ward's character as we knew him came to a conclusion when Coulson killed him, but Brett Dalton will continue to portray the new version of Ward as inhabited by the creature from Maveth. Though it isn't the first time a plot twist has altered Ward's character and relationships, his new identity will undoubtedly have farther-reaching and sharper effects on Agents of S.H.I.E.L.D., with even more emotional consequence than if the show had introduced a new villain. For the most part, the Agents of S.H.I.E.L.D. midseason finale is successful in wrapping up certain story threads and bringing other emotional character arcs to a kind of closure. But with so much to accomplish in a single episode, it winds up feeling more rushed than fast-paced. Still, although 'Maveth' doesn't quite live up to other highs of the third season -- truly, it's near-impossible to outshine '4,722 Hours' -- it does work as a good springboard for the back half of season 3 by wrapping up loose threads and setting up the Secret Warriors team, as well as a new and frightening villain for Agents of S.H.I.E.L.D. We learned a little more about Maveth in that the planet used to be home to nine cities of advanced beings that warred among themselves until they destroyed their entire race. There is also a large sculpture of the Hydra symbol. Coulson may have had the best pop culture reference of the episode after waking up on Maveth: "I'll be damned, Tatooine." Fitz's retelling of Hydra's famous line was peak sarcasm: "Cut off one head, and blah blah blah blah blah." Share your thoughts on the episode and theories about what’s to come during the second half of season 3 in the comments below! Agents of S.H.I.E.L.D. returns Tuesday, March 8th, 2016 at 9pm on ABC.